The LL.M. (Legum Magister) in International Business Law prepares students and professionals for operations such as large acquisitions or market transactions, crossborder mergers, complex financing, restructuring, LBOs, financial engineering, and industrial projects. The LL.M. 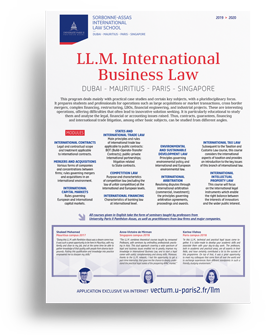 International Business Law is composed of 10 mandatory modules: International contracts, Mergers and Acquisitions, International Capital Markets, States and International Trade Law, Competition Law, International Financing, Environmental and Sustainable Development Law, International Arbitration, International Tax Law, International Intellectual Property Law. All seminars are taught in English. They deal mainly with practical case studies and certain key subjects, with a pluridisciplinary focus. Syllabus: the legal and contractual scope and treatment applicable to international contracts. Objectives and skills targeted: acquiring in-depth knowledge of the legal and contractual mechanisms governing the conclusion and performance of international contracts. Syllabus: the various forms of companies and concentrations between enterprises; the rules governing mergers and acquisitions in an international environment. Objectives and skills targeted: acquiring the capacity to identify the different types of business mergers and to identify the most efficient legal structure. Syllabus: the rules governing European and international capital markets. Objectives and skills targeted: acquiring up-to-date knowledge of the stakes and mechanisms specific to European and global capital markets. Syllabus: main principles and rules of international trade law: international contracts and BOT; public-private international partnerships; litigation related to State contracts. Objectives and skills targeted: acquiring in depth knowledge of legal mechanisms governing international public-private partnerships. Syllabus: Main features of competition laws (anticompetitive practices and merger control) in the context of regional economic integration : EU competition law as a model. Objectives and skills targeted: acquiring knowledge of European and international competition rules, both with regard to purpose and content, and with regard to application. Syllabus: characteristics of banking law at international level. Objectives and skills targeted: acquiring knowledge of international financing rules and practice (syndicated loans, guarantees, financing of different assets, project financing). Syllabus: the principles governing environmental policy and international and European environmental law. Objectives and skills targeted: acquiring sufficient command of international environmental law for its implementation in the context of international trade. Syllabus: resolving disputes through international arbitration (commercial, investment); the principles governing arbitration agreements, proceedings and awards. Objectives and skills targeted: acquiring knowledge of law and practice of international arbitration. Syllabus: this course considers the international aspects of taxation and provides an introduction to the key issues of this branch of international law. Objectives and skills targeted: the course highlights current practical issues faced by corporate taxpayers and States. Syllabus: refers to creations of the mind, such as inventions; patents; designs; names and images used in commerce.